Little Athena finds herself on a Wizard of Oz inspired adventure in this first Little Goddess Girls story—part of the Aladdin QUIX line! 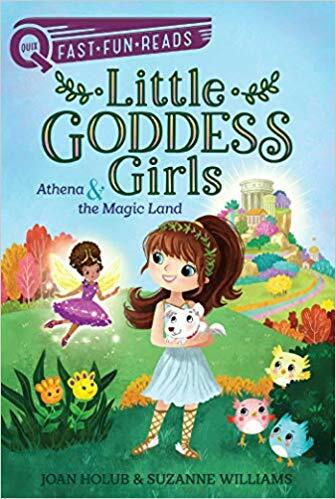 After a strange and sparkly storm carries her away from home, Athena finds herself in a land filled with magic, talking animals, and incredible objects with magical powers—the land of Mount Olympus! When Athena arrives, she’s greeted by the talking Owlies and is paired with very special magical sandals—sandals with powers that Medusa, a green, snake-haired girl, wants for herself! A glowing goddess (of hearth and home) named Hestia appears and warns Athena that if Medusa gets her snakes on those sandals, she’ll surely use its powers to make trouble for Mount Olympus! But Athena has more important things on her mind—like going back home! Determined to find her way back, Athena heads off on an adventure through the magical landscape of Mount Olympus to try and elude Medusa—and find her way back to the mortal world once and for all with the help of the great and powerful Zeus!